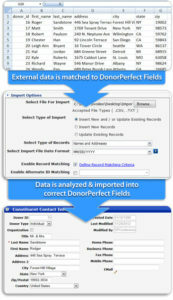 The DonorPerfect Import Module makes it easy to import new records or update existing records. What types of file formats can I import? Any comma, tab separated, .CSV and .TXT file can be imported. Also, other file formats such as Microsoft Excel or Access can be saved in ACSII format. Can I use this module to import data into my customized (user-defined) fields? Yes, the module can be used to import data into any field that exists in your DonorPerfect system in the main, address, phone, gift, and code maintenance databases. Will this module help correct any problems with data in my import file? Yes! Using advanced logic, the system analyzes the import file to make sure that all the information will be imported and processed correctly. It points out the errors while still in the import process, so you can make corrections on the fly without having to discontinue the import. How can this be used to update my existing DonorPerfect records? As long as the file to be imported contains data that can be matched to the DonorPerfect database, existing records can be updated with this module. Does the Import Module replace DonorPerfect Data Conversion services? No. While the Import Module facilitates the import of a wide variety of data, it cannot check for inconsistencies within the data itself, or protect against every type of user error. Ensuring that data brought into DonorPerfect can be used effectively requires a thorough understanding of DonorPerfect table structures and features. Our professional data conversion staff assists and identifies problems in your data that the import program would not be able to detect. For these reasons, the Import Module is generally most useful when there is an ongoing need to import data into DonorPerfect, whereas our data conversion services make the most sense for one-time data import.